Have your say here. Professional comments, technical information, passenger's views, suggestions for the site, requests for information - all welcome. Just e-mail Tubeprune. Readers' correspondence and responses from Tubeprune will be published on this page. New messages were last posted on 29 March 2005. I write this in reply to another article on this page refering to changes to the LU network. I believe these changes are quite possible, and would improve the current network greatly. The circle should be split in two, with the district running on the bottom half, and an improoved H&C service on the top half. This new service should have two branches from paddington, one to hammersmith, and the other to Kensington Olympia. The district line would be left with a branch to wimbledon, and its other current branches west of earls court. The metropolitan line should terminate at Baker Street, with a future extension eastwards in new tunnels, to perhaps Euston. With only one line running along the top half of the circle, capacity would be improved. At Paddington, new tunnels should be bored south east of the current district/circle line platforms, to a point on the H&C line, the current H&C platforms should close, with all H&C services running through the present district/circle station, which itself should be enlarged to three platforms - trains to Hammersmith, trains to Kensington, trains to the city. This should be extended westwards to victoria, providing a direct link to the city for commuters arriving at victoria. I agree with the writer of the other article, that a new West London Line should be formed using the richmond branch of the district and the ruislip branch of the central, and that the ealing broadway district line branch should be scrapped. However, the district should take over the uxbridge branch of the piccadilly, with all piccadilly trains running to heathrow. The district would then operate two branches in the west, wimbledon and uxbridge. The DLR should be extended from bank westwards, along the original proposed route of the jubilee line, to ludgate circus (city thameslink), aldwych, charing cross, with a single platform on a loop at green park. This would give people travelling on the DLR a direct link to the West End, and provide a much needed interchange at city thameslink. It also uses existing tunnels and platforms at charing cross. The ELL should branch at Dalston Junct, with trains running on the North London Line through Hackney, Homerton and Hackney Wick, then onto Leytonstone, woodford, and all stops to epping. The Jubilee line should be extended from stratford to provide interchange at Hackney Wick. To the East of Dalston Junction, the line should run through Highbury to Gospel Oak. National Rail services should abandon this line, with existing NLL services diverting at Gospel Oak to barking. Dalston Kingsland station would have to close. The DLR should take over the line south of stratford as planned. There should be an interchange on the ELL with the central at shoreditch high street. With the new West London Line service running on national rail tracks between North Acton and South Acton, the North London Line service should run from willesden junct to clapham junction. The line between South Acton and the junction near North Acton may have to be shared with crossrail, or separate tracks built, if the branch to hounslow via south acton and ilseworth is built. There are already plans to extend south of Brixton to a loop and single platform at Herne Hill. In the North the Victoria should take over the branch line from walthamstow to chingford. I agree that West Harrow should close, and the metropolitan line service to uxbridge should be withdrawn. An upgraded district line would provide ample service to uxbridge. This should be split in two, with the possibility of a south eastern branch from kennington across national rail lines, bringing the tube to south east london. In the North, the line could be extended from edgware towards watford junction as suggested. On the Hammersmith and City Line, Euston square should be linked to Warren Street, Gt Ormand St with Regents Park, and Edgware Road (H&C) with Edgware Road (Bakerloo). 1. Abandon the Ealing Broadway, Richmond and Olympia branches of the District Line. The District Line should run from Upminster to Wimbledon only, via Barking, Tower Hill and Earl's Court etc. Olympia station on the LU network should be scrapped altogether, whilst the lack of an Edgware Road District Line branch will means that Bayswater and High St. Kensington become exclusive Circle Line stations. Ealing Broadway is sufficiently served by the Central Line, whereas Ealing Common station can be used as an alternative for passengers wishing to change from the District Line onto the Piccadilly Line from Earl's Court. West Kensington station will need to be scrapped completely, whilst Ravenscourt Park, Stamford Brook and Turnham Green can be covered by adding them to all/peak-time Piccadilly Line trains. Chiswick Park will have to close. 2. The Richmond branch of the District Line and the West Ruislip branch of the Central Line can be merged (by forming a new Line, perhaps 'The West London Line') at North Acton and then running on Network Rail tracks stopping at Acton Central and South Acton stations. After Richmond, an interesting extension - though perhaps slightly elongated one - would be to run on Network Rail tracks around the Richmond Loop, via Twickenham, Strawberry Hill, Teddington etc., before terminating at an enlarged Wimbledon station (where passengers can change for the District Line eastbound via Earl's Court, Victoria, Tower Hill etc.). 3. I really cannot understand why the East London is extending itself westwards towards Finsbury Park when surely a more logical solution would be to extend it through Shoreditch, via Hoxton, Haggerston, perhaps linking with the Central Line at Bethnal Green, then up to Dalston, Hackney Central etc. before arriving at Leytonstone, at which time it takes over the Hainault branch from the Central Line. The East London Line would then run from Woodford to New Cross, with further southbound extensions to Lewisham, or I daresay even linking with National Rail services at Bromley South in Kent, surely a possibility. The pointless New Cross Gate branch of the ELL would be scrapped. 4. Extend the Bakerloo line southbound to New Cross or New Cross Gate, via Loughborough Junction, Denmark Hill, Peckham Rye and New Cross Gate (serving this station instead of the ELL). A possible further extension is to link up with the ELL at New Cross. This would be very helpful for passengers, especially those travelling up from Bromley (change at New Cross onto the Bakerloo Line for a quick route into central London). 5. The Waterloo & City Line should be renamed 'The Airport Line' and extended to take over the Heathrow Airport branch of the Piccadilly Line, allowing the Piccadilly Line trains to serve Uxbridge during all hours. The route: Bank - Waterloo - West Brompton - Hammersmith - Acton Town, then all stations to Heathrow Terminal 4 (or 5). 6. The Uxbridge branch of the Metropolitan Line should be abandoned completely. Uxbridge is more than enough covered by the Piccadilly Line. West Harrow station should be disused. So, too, Chesham station. The Watford branch also needs to be scrapped. Metropolitan Line trains will now run to Barking, instead of Aldgate to cover for the entire abandonment of the Hammersmith & City Line. New route: Amersham - Barking. 7. One of my pet hates is the Circle Line. I think the idea of going round and round all day is simply too outdated. There needs to be a new Terminus built at Edgware Road where trains can be stabled in traffic hours before making their return, anti-clockwise journey. Circle Line trains will need to also cover the Edgware Road - Hammersmith branch of the former H&C Line. Paddington station on the H&C needs to be closed. The proposed new Circle Line route is to stop at all stations on the 'circle' via these major ones: Hammersmith (start) - Edgware Road - King's Cross - Tower Hill - Victoria - Paddington - Edgware Road Terminus (end). And then the return journey would be to go back the way you came from Edgware Road Terminus (a different platform to the one used as a two-way station in between Baker Street and Paddington) to Hammersmith via Tower Hill and Kings Cross and Baker Street et al. This would mean that for passengers travelling on the Circle Line from Hammersmith, the quickest way to get to Paddington would be change onto an anti-clockwise train at Edgware Road [Terminus] then go back the other way. 8. You'll be pleased to hear that I am willing to leave the Jubilee and Victoria Lines alone. The Northern Line needs to be simplified and split into two separate lines, with perhaps the Edgware branch extending itself northbound to St. Albans Abbey, Garston, Watford Junction and then possibly over to one of the abandoned Metropolitan Line routes at Chesham or Croxley. But that possibility is for another day. As I'm sure you know already, you can download driver's eye videos on the District line from jubileeline.homestead.com. There is one thing that I'm particularly interested in though. Upon leaving Putney Bridge in the direction of Wimbledon, there is a large rectangular yellow sign with the words "WEAK FIELD FLAG UP" on it in black writing (located where the starter should be, but a little lower down). Is this a tube sign? If so can you tell me what it means? Underground trains built before the 1990s have resistance controlled DC traction motors. The electrical arrangement of the motor has two main parts; the armature and the field coils. If the magnetic characteristic of the field coils is weakened, the motor can achieve a higher top speed. The weakening effect can be achieved by inserting a resistance into the field coil circuit. Since there are certain parts of the Underground where a higher speed is useful, i.e. where there are longer distances between stations, trains are provided with a manually operated switch in the driver's cabs to initiate this field weakening circuit and thus provide a higher speed. The switch is operated by a metal flag which, when lifted, shows to an outside observer that weak field has been selected. This is to ensure that drivers don't use it where they are not supposed to. When in use, the black and yellow striped flag can be seen in the offside cab window. At the start of sections where weak field operation is permitted, a sign is provided like the one you saw at Putney Bridge. You might remember that I wrote to you asking about a white square sign with a large black 'S' in the middle of it. This is found on the headwall of some Central Line deep-level stations in the direction of trains (i.e. near where the T/O stops with the train). Today I found out just what it was. It is put up by a station assistant when one is in attendance at platform level to tell the T/O that a Station Assistant is there if he/she needs help. 1 - What is meant by the term passenger action, which is often announced as a regular cause of delay on the network?. Passenger action is things like suicides, vomit on train seats, vandalism, illness, slips & trips, crime etc. 2 - Why are some tube drivers so reluctant to make PA's to their passengers, can they just not be bothered? (especially it seems on the Met line). The British are not naturally outgoing and do not like to use PA systems. On the Met, it is difficult to use the PA unless the train is stationary as the driver needs two hands to drive on this stock. 3 - How fast do the A-Stock go or how fast have they been pushed up to? It sometimes feels like we are going about 70 mph on some of the fast sections between Finchley Road & Harrow on the Hill. The maximum officially permitted speed is 60 mph. I once got one up to 86 between Amersham and Rickmansworth up road but the train was empty stock and it's all downhill. You might get 65 between Harrow and Wembley Park fast up road if therre is enough "juice" around. It may sometimes feel faster than it is due to the rough track. 4 - Apparently the steam on the Met events are unpopular with drivers & managers because of all the dirt produced by the steam engines & are reluctant to have another event. Is this true? I don't know but it may have to do with safety and because the PPP has split the responsibility and no-one can afford to get it set up in the new commercial world. 5 - I saw that new stock for SSL has been revealed. Any news or opinions on these new trains from the drivers themselves or anyone else inside LU? No-one has seen any more than what has been revealed in the press - a pretty computer generated image. The first of them will not appear until 2008. Design work will not start until early 2005. Anyone could have thought a new ice age was upon us the way things stopped a couple of days ago..
Any comments from your side about recent events? Disgraceful - fancy closing stations because of ice on the platforms. Why didn't they spread salt/sand like they used to? Poor operational management, obviously, especially as the Met. Office had forecast snow several days in advance. The section of wood inserted into the negative current rail at Victoria NB Victoria Line was done deliberately to solve a unique problem with the ATO system at that location. The story dates back to the early days of operation on the Victoria Line when some trains suffered spurious emergency stops when starting away from Victoria NB. After some experiments, it was found that a short section of insulation material (said piece of wood) cured the problem by eliminating the excessive spikes in the traction supply believed to be causing the tripping. The full story is contained in a letter to Underground News February 2003. It makes very interesting reading. Underground News can be obtained from the The London Underground Railway Society . In reference to the wooden section in the current rail at Victoria, I don't claim to be an expert on electrical traction, so I don't know whether it stops spikes. But the picture I saw showed the wooden section inserted in such an amateurish and dangerous way that I couldn't believe LUL would have done it but there it was in front of me, the photo doesn't lie. Even I know that the shoegear on trains must be guided over points etc by the use of wooden ramps. The picture I saw showed the rail section to be protuding upwards in such a way as to surely catch any shoegear plus the fact of the brick and nails used as fixings. The Evening Standard newspaper of London today (29th January) published a front page photo of a wooden insert in the negative current rail at Victoria (Victoria Line). Obviously it is a temporary repair and not a very good one. However, giving the whole of the front page to it is clearly an attempt to blacken LUL's reputation further and demoralise the staff at a time when things couldn't have seemed to be able to get worse. How can such a newspaper say it speaks for London when it tries to make London look worse than it is. This is just kicking LU when it is down. This sort of thing just gets the press a bad name. Shame on you! -an inexperienced operator attempted to make up lost time by speeding past timed speed control signals, geting tripped at 2 of them, manually resetting the emergency brake tripcock and not notifying transit control as is policy (all trains and signals now have black boxes that tell control that a train was tripped). -the third SPAD (again at a Grade Time signal- this stretch of tube has steep downgrades and sharp curves) that the operator went through had a faulty trip arm that failed to trigger the tripcock. - the driver was travelling at or near 80 km/h when the signals should have kept his speed to 50 km/h. - he rounded a curve after the 3rd SPAD and saw a train stopped in the tunnel ahead. He let go of the deadman handle and ran from the cab. The EB application slowed the train to 45 km/h at impact. Four people died and amazingly only 100 or so were injured. The press ignored these facts and painted the TTC as unsafe ( although they were partly to blame). This was the first and only major incident on the Toronto Subway from 1954 to today. According to thetube.com, the shortest distance between two Underground stations is 0.26km between Covent Garden and Leicester Square on the Piccadilly line. However looking at the A-Z, as the crow flies the shortest distance is between Charing Cross and Embankment on the Northern Line. Do you know what the actual track distance is between Charing Cross and Embankment? I often wondered why trains need to slow down to 5 m.p.h when approaching and passing a station that has tempararaly closed, e.g. when the fire bragade was on strike in November which resulted some stations being closed. Why can't the driver just speed through the platform, making the journey slightly quicker? Is there anyway of finding out how deep the Victoria line runs between Victoria and Oxford Circus and also the depth of the Central line between Oxford Circus and Holborn? Most tube line tunnels are an average of 70 feet below the surface. The levels vary due to stations being on humps and the crossing of lines at various locations. Some tunnels are built one over the other as at Chancery Lane and Notting Hill Gate. Why is it that the 1973 Stock on board Dot-Matrix indicators are never on? I use the Piccadilly Line regularly and my experience is that about 20% of them are not working. I assume that as the system isn't essential, the time needed to keep it in working order is not considered worthwhile. The new oyster cards are all electronically serial numbered. If you lose it, simply report its loss and it is immediately invalidated on the London Transport system. This means that within 24 hours of you reporting it, every machine with an Oyster card acceptance disc (the yellow pads) will have been in touch with the central reporting computer system to download its audits etc and part of the information that is sent back will include your invalidated serial number. Anyone who may be minded to think that they can report theirs as lost and give the replacement to a friend etc simply because they technically do not have to show their card will be in for a shock. These new cards are light years ahead in the technology department from their predecessors. I know in the past there was a way to get 2 passes for the price of one, but believe me, Oyster is not like that. You will just have to believe me when I say that these cards have been thoroughly tested for this sort of occurrance. Of course if you let someone else travel with your pass and they get away with it, then there isn't really anything more than what can be done today. However, Oyster cards do not mean that the Hounds of Hell (sorry revenue protection officers) will be retired, oh no. Oyster will still be checked by these guys in much the same way as the current cards are. To give you an example. Yesterday I took my son to the science museum at South Kensington. An RPO was checking travel cards etc at the gates. My son travelling on his priv ticket wasn't checked, but I used the gate he was on and obviously used my Oyster to operate the gates. This meant I didn't even have to take my wallet out of my pocket (something I rarely do anyway!) Despite the fact that at present it is only LT staff who are just starting to get the Oyster Card, I was still asked to show my Oyster card and Photocard, and to cap it all, he even had one of the new style hand held card readers to check the validity of the Oyster card! So for those of you who wish to be fraudulent in the use of your travel card, it is entirely your decission to be so, but Oyster will not make it any easier for you. As far as I can gather, LU stock operates on 630v DC current, taking +420v from one rail and -210v from another. On the other hand, BR stock (might as well call it that) operates from 750v DC, from a single conductor rail. I can think of many places where LU stock operates over BR rails, but I cannot think of an example of the opposite - at least in terms of EMU stock. If such an arrangement indeed does not exist - is it because of this reason? Or, if such an arrangement does exist, would BR stock be able to operate over rails electrified to the LU voltages? LU now owns the Wimbledon branch south of East Putney so BR trains do now use LU tracks. The traction current arrangements are the same. There is no reason why trains can't use slightly lower or higher voltages. It will just affect performance. The 630 volts quoted for LU lines is nominal. The range can go as low as 400 before the substation breakers will open and as high as 780 or so. It just depends on the load and other factors. I often wonder what if a train operator needs to go for a wee while he's on his journey? It must happen? I have often wondered if a driver (bloke obviously) has ever resorted to using a bottle or if in fact this is the norm? Most drivers will wait until the end of the trip - the longest is about 1 hr 20 mins. All sorts of tricks are used (doing it out of the side of the train, in a siding, in bottles etc). but the most awkward situation is where the driver need to do more than "wee". Then he will ask for a PNR (Physical Needs Relief). A spare driver will be instructed to meet the train to allow the driver to get off for his "physical". On the Central Line, a driver can be taken off at White City (westbound) while the spare man (or woman) takes the train to Ealing Broadway and back. The rostered driver will pick up his train again at White City on the eastbound. In extermis, drivers have been known to resort to a temporary toilet, using a few sheets of newspaper and some sand on the cab floor. Of course, abuse of the PNR facility happens from time to time. Circles are the favourite. The only relieving point is at Edgware Road and, if a driver is taken off there for a physical, the spare driver has to go all the way round the Circle. This gives the rostered driver a trip off. Maybe a driver could take a physical on the last trip of the duty, so he could go home early.......they wouldn't do that, would they? H & C Beyond Barking? Why can't Hammersmith & City trains carry on past Barking in the peak hours? I mean they are used as District Line trains on the Edgware Road branch, right? The number of passengers reduces beyond Barking, so the need to run additional trains along this section is not there. Apart from anything else, there is also a gauging problem for the C Stock somewhere around Dagenham, I think. Apart from the A stock currently used on the ELL and the D stock in the mid '80's, I am sure I saw a picture once of a tube (like old Central line stock) on the ELL. Have any deep-level tube trains been used on the ELL? 1938 Tube Stock was used on the East London Line from January 1974 until June 1977. Always wondered..was there a 3rd platform at East Ham station ever? On the other side of the eastbound platform there is space enough for track but there's nothing there except flowers and weeds. Yes, there was a bay road there for many years. There was a connection from there to Woodgrange Park. Finally, I don't understand how comes there are disused platforms at Gloucester Road and I think another station a few stops away..maybe High Street Kensington? What lines used to stop there and why the disuse? The disused platforms you refer to are at Gloucester Road and South Kensington. The section of line between these stations was originally 4-track, two for the Metropolitan and two for the District. Gloucester. There was also a bay road between the two platforms at South Kensington and another where the Piccadilly Line escalators are now. The whole area was rationalised in 1957 to reduce costs and give better interchange between Circles and Districts. On another website, and in at least one book I have read recently, I saw reference made to 1949 Tube Stock. Was this a newer version of 1938 Stock, or something different? Yes, they were a newer version of 1938 Stock. 1949 Tube Stock was an additional set of cars purchased to expand the 1938 Tube Stock fleet. They consisted of 70 UNDMs and 21 trailers. They were scrapped with the rest of the 1938 Stock Fleet. I remember a tube yard under what was the old BEA terminal on Cromwell Rd, Kensington. I recall it had about five entrances, ranging from stairs down to manhole type doors. There has been substantial development on the surface area, including a new supermarket and demolition of a tower block. I was wondering if this siding was still operational, as this area is prime real estate and might have been sold to developers. It,I felt, was always a bit of an anomaly on the network, being a subterranean depot, hidden from all but staff and local kids like myself, who would skip school and have a crafty ciggie there in the late 70s. Any pics? Yes, the sidings are still there but it is not a "tube" yard as such. The sidings are used by the C Stock of the District Line for Wimbledon to Edgware Road services. I have not seen any pictures as the sidings are always in the dark. What is Parallel and Series on a TBC (Traction Brake Controller)? These are the two motor groupings used in DC traction control to vary the power in the motor circuit. Series will give up to 20 mph while parallel will allow up to full speed. Could you tell me the reason why the Epping to Ongar branch was closed? It was too expensive to run for a few passengers. Some weekdays, the numbers of passengers travelling were below 80. 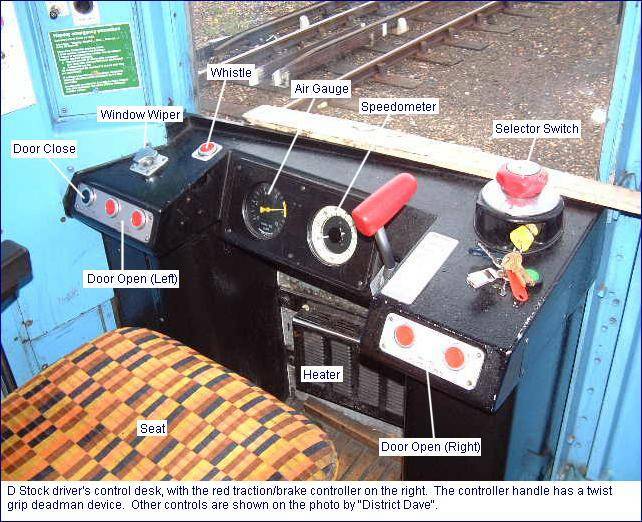 How does the radio in the cab work, and how does the driver ring through to the signal cabin? The cab radio uses a leaky feeder cable in the tunnel. The messages are exchanged with the line controller. If the driver wants to speak to a signalling room, he has to use the signal post telephone. And also what triggers the voice on the train to tell you what station you are at. Is this done by using a track circuit to trigger it. The automatic voice system is actuated by wheel revolutions, which are checked for location accuracy at intervals by track mounted transponders. Just to clarify the above: Central, Jubilee and Northern automatic announcements are controlled by trackside systems; the ATO system for Central; the facilities put in for ATO on the Jubilee and a varient of the standard Correct Side Door Enable on the Northern. Victoria, Bakerloo and C stock are done entirely on the train with no trackside input whatsoever - clever eh? I was wondering about the Space Train project on the Victoria Line. I really like this train very much indeed but since this project is unlikely to come true, I was wondering: imagine if LU had a lot of money or was rich enough to make this train and to make the wheels a lot smaller. Will the train be driverless like the DLR and people be able to see the old dark tunnel of the Victoria Line, because reading from the book 'Underground Movement' from LT museum the front design looks so open? Is it true that the widening of the platform may be required? Also, what about the tunnel or the tunnel walls (where the advertisement are place opposite the platform), will they required to be widened? Because I keep on imagining on how wide will they be if they run on service. Do you have any more information about the Space Train project and is any picture available on the net or is only in books? Space Train will not happen. The development costs would be very high and would take a long time. The UK government does not allow LU any money nowadays for research and development. The cost of widening the tunnels would be prohibitive and would require the Victoria line to be closed for long periods. I do not know of any pictures other than those published in the press. Is the lifting rope for lifting up the shoe gear? Yes - when pulled, the rope lifts the shoe. There are two clamps which grip the rope when it is released to prevent the shoe from dropping down again. I once heard that the Central line's positive rail is in a different position than other lines, and that trains transferring have to have their shoes adjusted to suit. Can you shed any light on this, as I can't find any reference to it? Yes, the Central Line's current rails in the old tunnels are gauged slightly differently from those of other lines because of the tight gauge along the original route between Wood Lane and Bank. The tunnels were bored to a slightly smaller size than those of the Bakerloo, Piccadilly and Hampstead lines. Shoegear of trains is altered to match the different movement range required. I've noticed that every Victoria line platform seems to have a series of six yellow squares containing a black diagonal cross on the wall opposite the platform at the cab end. As I don't recall ever seeing them on any other line, presumably they're something to do with the ATO, but what exactly? Does anyone know? Yes, they're to remind drivers to open doors on the other side. The Vic Line does not have Correct Side Door Enable. I think that an article about train set numbers would make an excellent topic for the website, on what they mean and how different lines use them. From my days in the Capital, I remember Bakerloo trains having set numbers mainly less than 100 (ditto the Central, District, and Metropolitan), while trains on the Circle, Hammersmith & City, and Piccadilly lines had set numbers in the 200s and 300s. I might have remembered seeing a Piccadilly train @ Rayners Lane on a Saturday in 1971 having the set number of 500 (which would be out of the aforementioned range). In particular, I remember the following allocation of Metropolitan set numbers: Single digits, 10s, and 20s: Amersham and Watford 30s, 40s, 50s: Uxbridge 60s: Off-peak trains on the Watford branch, created when 8-car trains used to be uncoupled 70s: Off-peak trains on the Uxbridge branch, again created when 8-car trains were uncoupled. Train set numbers on London Underground are the numbers which appear on the front and rear of each train to indicate the path it is supposed to take in the timetable. It is a useful way of identifying trains and the crews working on them. The use of train set numbers varies with timetable, fashion and line. Originally, each line numbered it's own trains from 1. When programme machine control appeared in the late 1950s, train numbers were limited to binary code using three digits. Thus train numbers could only contain digits from 0 to 7. You will never see an Underground train with the numbers 8 or 9 in it. The restriction on numbers extended the range and made it essential to separate, for example, the ranges of H & C, Circle and District train numbers. Thus, in the early 1960s, Circle train numbers used to be 161 to 167 Outer Rail and 171 to 177 Inner Rail. H & C trains were 181 upwards. District trains were numbered 1 to 100 with some gaps. Train 100 was the South Acton Shuttle and the Olympia shuttles were 90 and 91. When programme machines came into operation, all Circle trains became 200s (201 to 207 and 211 to 217) and District trains used the numbers 1 to 77 and 101 to 135 IIRC. H & C trains were 221 to 243. All groups were restricted to 7s. No 8s or 9s appeared. When Tubeprune worked on the Metropolitan, A Stocks uncoupled became 400s. However, it is the practice to number trains in groups by service or depot of origin, depending on the line and the person compiling the timetable. The rolling stock summary at the front of each Working Timetable (WTT) will list the train set numbers. One line, the District, has a "Set Working Book", which lists the trips by each set. Is there anyone who would like to shed more light on the subject of train set numbers? In late 1990: - District was 1 to 171; 7x, 16x, and 17x were C stock. 15x were the Olympia shuttles; all other 1xx trains stabled between the peaks. - Metropolitan used 1 to 77; train 7 was the Chesham shuttle. 4xx were used for engineering paths (train turning paths, transfers to New Cross, that sort of thing). - Hammersmith & Circle were 201 to 247. Those trains working on the Circle for much of the day were 20x (Outer Rail) and 21x (Inner Rail); the last digits run in sequence during the day. The Jubilee used 3xx. and the Piccadilly used 250 to 377. The East London Line used 17x (so both District and ELL had a 171). Until the 1980s the District provided some Circle trains on Sundays. They were 11x (Inner Rail) and 12x (Outer Rail). The last digits fitted in with the H&C ones (so the sequence on the Outer Rail might be 201, 202, 123, 204, 125, 201 again). A few years ago there was some issue because one control centre was now seeing both Metropolitan and District trains, so the Met. got renumbered to use 4xx, and the engineering paths changed to 7xx. On a most lines, numbers are arranged so that at least during mid day off peaks, consecutive trains running a particular section of the service, e.g. W Ruislip-Epping, or Ealing Bdy-Hainault, are numbered consecutively, in different groups, whereas those stabling between peaks are also numbered consecutively in groups depending on where they stable . Further, previously on the Northern Line, for most of the day, the CX Branch Service was kept separate from the City branch with the former numbered 1-77 and the latter 101-177. Nowadays trains operate both branches throughout the day and no such separation is possible. Train numbers are chosen so that trains running on adjacent lines can never have the same train number. Here are some I have been able to find out, maybe someone can give us the Jubilee, District (District Dave? ), H&C, Central, Circle and ELL?? A bit more info on Train Numbers for you all. On the Central Line you may come across Empty Stock Moves or Specials operating during Traffic hours. Train Crew Depots on the Line are numbered as: Ruislip 200, White City 300, Leytonstone 400 and Hainault 600. An additional train say from White City would be given the number 301. This then identifies where it originates from, 601 from Hainault and so on. Occasionally the Control Room Staff will use 666 from Hainault just for the hell of it but strictly speaking there seems to be no 'rule' as to what no. is applied just so long as the Train number no. and Timetable number match (an additional Trip 81 is entered in to the system by staff at the Control Room for ARS purposes). 1) Why don't the door open/close buttons on tube trains work anymore? There is an official directive to the effect that thought this facility still works on all trains fitted with it, it must not be used. AIUI this is because, on the Central Line at least, one passenger can actually shut another one in the doors, causing injury, and a blanket rule is easier to observe since in theory it causes less confusion. The only time I've seen them work in the past 4-5 years is the other night when it was very cold, even then we waited outside the train as we didn't realise. Some drivers rightly choose customer care issues (cold weather) over the rulebook, and put the doors on customer mode to keep the warmth in, but as you point out, it does cause confusion. More to the point, why do some people feel the need to press them repeatedly at each station even when it is obvious that they don't actually do anything. d) unfamiliarity with the system. 2) Why is it that at various points, particularly on the District/Circle Lines, are the line-side cables coiled round several times at the side of the track. Probably because it's easier than cutting them and rejoining and, since the wires inside the rubber are metal it allows from some slack for expansion/contraction during extreme weather, and also a little bit of surplus in case another bit of line side equipment is fitted and the cables need a little extra length to stretch round it. Having some slack here and there seems to be more economical than cutting and rejoining them, which in itself could lead to problems since some cables carry upwards of 600volts of DC electricity and others carry 65psi of air pressure. You'd need a big puncture repair kit for that and imagine the fireworks if a botched job was done on the electric cable and then it rained. 3) What is the difference between 'Special' trains and 'Not in Service' trains on the Central Line? No difference AFAIK. The 'special' terminology is usually found on older trains with wind round destination blinds, whereas more modern stock with electronic displays has 'not in service'. If there were a choice of both on one train, special would denote a special working, e.g a stock move, whereas not in service would suggest the train is running empty because of a defect or is timetabled to run empty. > 4) How do the trains on the Jubilee Line control the platform doors so that - most of the time - they open at the same time as the train doors? There is an electronic signal (like opening your garage door I suppose) between the train and the platform door control. The platform staff who have to be in attendance on each JLE platform (or else it closes) have a hand held device which can open the platform edge doors, but not those on the train. What are those strange creaking noises under A Stock? The whole carriage appears to groan under the strain of moving off (like it's falling apart). I know exactly what you mean, the noise from the generators that maintain the air pressure under the trailer cars can be deafening sometimes. Don't worry about the creaking noise. It's not structural. It's only the movement of the drawbar and buffer interfaces between the cars. The A Stock has always behaved like this. The '59/62 Stock did too. It's the dry areas around the joints where rubber is used to reduce vibration. The A Stock has the best body construction on LU. The other noises referred to are the compressors (very loud because they are reciprocal pumps and getting on a bit in years) - intermittent because they switch on and off with the need for more air pressure - and the motor alternators (under the motor cars only), which give a constant whine because they run all the time to charge the batteries and run the lights etc. (the same as the alternator in a car). Do you have any information on Neasden? Neasden: Opened 2 Aug 1880 as Kingsbury Neasden. Two new tracks were added on the west side for the GCR extension to London in 1896 and were opened in 1899. There was no platform for the station for these new tracks. The station had two additional tracks with platforms opened in January 1914 as part of the Metropolitan quadrupling to Harrow. 20 Nov 1939 the station was involved in the conversion of the Metropolitan Line's local services to the Bakerloo Line service to Stanmore. Metropolitan Line trains only stopped there rarely after that time, usually early morning and late evening. 1 May 1979 the Bakerloo service was taken over by the Jubilee Line. I do not think there have been any substantial changes to the structures at Neasden since 1914 except for the building of a subway for staff access to the depot at the north end of the platforms in 1922. The train crew rooms on the down fast platform were demolished after the construction of a new crew centre in the old goods yard in about 1969. I lived in London as a child in the 50's/60's. When we travelled on the Northern Line between Angel and Kings Cross, we always used to "look out for the dip"! Was there really a sudden change in level in this section? Yes and no. It wasn't a dip, it was actually a hump. The original City & South London Line had a signal box at a location below Weston Rise (then called Weston Street) and the line at this point was built on a hump like the stations. When passing the signal box, trains experience a sudden drop as they descend from the top of the hump. You can still feel it today. Do the "X" shunting signals still exist at Ealing Common Depot on 19 & 20 Roads when entering from Ealing Common Station. Yes. "District Dave" confirms that WMX 100 is on 19 road and WMX 102 on 20 road. Thanks Dave. On lines like the Central, District, Metropolitan, Northern, and Piccadilly - where there are multiple branches - how are the routing patterns determined? For example why do the bulk of Central Line trains on the West Ruislip branch go to Epping instead of Hainault and on the Metropolitan Line why do the majority of Uxbridge branch services go to Aldgate--instead of the majority of Watford branch services? I've often wondered that myself. In some cases it is purely historical. However, I suggest it may be that on certain lines the pattern of services is driven by the patronage for each route. Anyone else any ideas? The tube stocks now used vary from cab to cab, but I wondered what it was like for any one going from the right-hand "deadman" device to the left-hand "TBC" device on the Northern line when the 1972 Tube Stock was introduced. What is it also like using the Left hand deadman? I am right handed and it always left a thought. Once you got used to the new controller on the left hand side, it was simple to swap from one type to another on the same duty as drivers used to do on a number of lines. Remember that the left handed controller was a combined traction/brake controller. It was placed on that side because it was thought that, as the brake was always on the left, drivers would instinctively use that hand for braking. Actually, the technique for driving with the left handed controller is so different from that with a two-handed set up that the argument was completely fatuous. Tubeprune knew some drivers on the Circle who used their right hand to drive with the C Stock's left handed controller but not many. It was easy for Tubeprune, who is left handed. Regardless, the old controls were much easier to use but the new ones from the 1990s are a great improvement on the 1967-77 range of trains. As a District Line Train Operator I operate both C and D Stock Trains. The former has a left handed CTBC (combined traction/brake controller) which works in a 'circular' plane, the latter a right handed CTBC working in a 'fore/aft' plane. I am right handed, but have never found using the C Stock controller any more awkward, just different! Personally I prefer the D Stock type as it feels more natural and logical (forward to accelerate, back to coast/brake etc.) whereas on the C Stock the situation is reversed (towards you to accelerate, away from you to brake). I occasionally drive a D Stock with my left hand as on a long duty (perhaps over four hours in one stint) I find particularly my right wrist starting to ache a little and a few minutes 'left-handed' relieves this. Occasionally one finds oneself going for the CTBC on the right when driving a C Stock, but not often. The two trains are so dissimilar that they're hard to confuse. More often you find yourself looking in the wrong place for other equipment/indications - the layouts could not be more different. See photo of D Stock driver's desk here. What is the top speed of the D Stock? 40 or 45 mph? The D Stock was provided with coasting control so that its speed in tunnel sections would automatically cut out at 40 mi/h. The real top speed is greater than this but it will depend on the current available at the time. You would be safe in saying 45 mi/h is a reasonable top speed. Gloucester Cars and New Bombardier Cars? I live in Toronto, Ontario, Canada. This site is fantastic...full of all the technical details that tube/subway fans would want to know. I am curious. Did LUL ever use tube or surface stock manufactured by the Gloucester Carriage Company. Toronto's first subway cars were manufactured by them then shipped across the Atlantic for the opening of the Yonge St. subway in 1954. They lasted over 40 years before retirement. I was also wondering if LUL plans to purchase any rolling stock manufactured by Bombardier as they seem to have the market wrapped up tightly in North America and Western Europe. cars had a number of features similar to the R Stock batch of cars built for London, some of which were built by Gloucester. As Bombardier is part of the Metronet consortium which has become one of the preferred bidders for the PPP (Public Private Partnership) to restore and maintain the Underground, it seems inevitable that they will build large numbers of new cars for London. A 3 car D Stock set was seen on the evening of 27/11/01 freshly repainted into the London Underground livery at Museum Depot. It had not been refurbished inside nor had windows been inserted at the ends. Otherwise it looked very similar to a C Stock set. This is probably the 3-car set which was painted at Acton Works recently. There has been an on-going project for about 3 years to try out a refurbishment scheme for the D Stock. The trailer car has had an interior refurbishment. The cars are Nos. 7008, 17008, 8008. At Euston Square and Aldgate East (among other stations), you can see both platforms and both tracks in one tunnel (these lines were built using the 'cut and cover' method, now obsolete and they are not really 'tubes' - the sides of the tunnels are straight instead of curved). I saw a picture on another web site and it said it was the westbound cut and cover platform at King's Cross. Here, however, you can only see the one line. Can anyone tell me why this is? I am not certain if I understand the question properly but I think you are referring to the layout at Kings Cross (Met Line) station. The present station was built in 1941 with two through tracks either side of a centre reversing track. The reversing track was later removed and the tunnel became the present lower circulating area where passengers pass through when going to the platforms. The station is actually a 3-arch version of a cut and cover tunnel. The old station was located next to where the Thameslink platforms are now. You can still see the old inner rail platform as you pass. If there's one thing that gets my blood boiling about living in London, it's graffiti. As a daily traveller on the Northern Line (Highgate to Elephant and Castle) there's nothing more depressing than seeing window upon window on relatively new stock scratched and defaced. I'm interested to hear what ideas there are to get rid of this annoyance? Mine all involve doing very nasty things to the perpetrators! And who (or what) is the mysterious ENZOH I see scratched everywhere? Removing the perpetrators permanently from this Earth would be a good start but in our age of "freedom", whilst a large majority of society would like to see some sort of punitive action taken, this is not considered acceptable by the media and governmental "spin doctors" so a lot of fare payers money is wasted changing glass. There are some protective coatings available but the vandals have found ways of getting through these. I read somewhere that work will commence towards the end of this year on the initial East London Line extension. Presumably, this means that LU has decided what the stations will be etc, but finding some sort of official confirmation is extremely difficult. Is there an official web page anywhere or some other definitive source? Ultimately, this will form a major new railway, much longer than either the Bakerloo Line or the Victoria Line. I know it will be less busy, but shouldn't LU be more exuberant about their new major project? Finally, will Croxley to Watford ever happen? What is the latest excuse that all concerned have for doing nothing? The most recent information about the East London Line is available in "Modern Railways" September 2001, "ELL - from shuttle to Metro". The northern extension has TWA powers and it is expected preparatory work will start before February 2002. LU being exuberant? Not their style really, is it? They know that most passengers will say, "Don't mess around with minor lines, fix the major ones like the Northern, Piccadilly and Victoria Lines." Croxley to Watford? Probably they can't see the investment required generating enough traffic or interest to make it pay in a cost/benefit analysis. Thanks for your previous replies. I have another question. I've been reading about abandoned stations. Between Baker St and Finchley Rd on the Metropolitan there was a station called Marlborough Road - but there is no street anywhere near it with that name - does anyone know how the name was arrived at? Also - I heard recently that York Road station (Piccadilly I think, north of KXSP) might be reopened at some point - is this under serious consideration and if so why is it now suddenly considered viable? There was a street with that name when the station was opened in 1868 but the name has since been changed to Marlborough Place. It forms a junction with Finchley Road on the opposite side to the station building. The station building is on the corner of Queens Grove (then Queens Road) and Finchley Road. York Road station site is on the Piccadilly Line. I have not heard that it is to re-open. It would cost a lot of money to do so, especially since there is not much at track level. The platforms have gone from the westbound road at least. I recall there was a rather spectacular accident between there and Kings Cross in the mid 1960s, when a ballast train became derailed at speed just before the first passenger train was due and removed much of the current rail and signals on the westbound. It closed the line north of Kings Cross on the Saturday until 15:00 hours. What purpose is the 'Rail Gap indicator' to drivers? What action should be taken when the three lights illuminate? The rail gap indicator tells the driver that there is no current available on the section beyond the indicator. He should not take his train beyond the gap as it may become stalled. What is the future of A stock? It is now very old and presumably will not last forever. Is anything being planned at all, or will it still be trampolining passengers along for its 50th birthday around 2010? The A Stock might last that long, although LU would like to replace it earlier if possible. Perhaps the PPP will offer early replacement. If it was part of a complete sub surface line replacement plan, it would make sense economically. Anyway - PPP and Privatisation in general - This may sound over simplistic, but if the Government think private companies could make a profit out of the Tube - why can't they? Also - New lines - I'm a keen supporter of these ideas but I wondered what proposals/routes the professionals favoured? Personally I reckon a line along Uxbridge Road would be a good idea. Also - as I travel along the line fairly often I wondered if anyone could help me with a question. The overground line between Victoria and London Bridge via Peckham - it never goes outside Zone 2, connects well with the Tube and causes major crowding on Victoria NR Station because the service is so relatively sparse - how feasible (if at all) might it be for this line to be run as part of the underground? Possibly an extension to the Victoria Line? I'm just thinking. First, your question on profit out of running the tube. The PPP companies will make a profit because the government will pay them to do the work. The price they charge for doing the work will include a profit margin. The public sector could also do the work but they are not subject to commercial contracts like the private sector so they tend to allow overspending and late completion. The private sector will manage the work better because, if they don't, they will lose their profit. Also, raising the money for capital works is done by the PPP companies using the commercial Banking system. The Treasury have set themselves strange and restrictive rules which prevent public sector organisation from raising money competitively. If the problem was ever to be solved, the Treasury would have to be forced to change their way of working and public sector organisations would have to be allowed to raise money through the commercial banks. This is close to the Livingstone/Kiley proposals. Yes, London needs new lines. Along the Uxbridge Road would be a good idea but it needs a balancing route on the other side. The nearest proposal has been Crossrail - this has been planned for the last ten years. As for the "South London Line" as it used to be called; it is a long way round and a bit slow for a good connection between London Bridge and Victoria. The Victoria Line is already overcrowded and it cannot support any extensions. Why, on the tube, does the train 'Stop,Start' sometimes as it pulls out of the station. Usually accompanied by a loud noise as though the train has lost traction or current for a few seconds. It has. Often, a traction current sub station section gap is located on the exit side of platforms. Notting Hill Gate is a good example. Victoria (District) is another. The sound you hear is the traction motor control switching out as the current is lost when the car passes over the gap. The noise is loud because the current is high at that point because the train is accelerating. Just wondering whether anyone can tell me the percentage of people who get killed in "one-unders". I've had 1 myself and they survived. Out of all the jumpers I hear of when running about the combine (I've worked on a few lines) most seem to survive. Can anyone shed any light? There are about 100 to 150 a year over the system. There tend to be more in periods of prolonged bad weather or economic depression. The suicide pits you see at tube stations were put in during the 1930s because of the high number of suicides. They help to reduce deaths and they make the rescue of bodies easier. Tubeprune had two during his time on the trains. A stiff drink afterwards with a few mates helps the healing process. In Tubeprune's time, this was the best form of "counselling" you could get. One of the suggestions I have seen on the Discovery Channel is that Leslie had a brain seizure, causing him to carry on what he was doing before the end. He had his hand on the deadman's handle in the parallel position. There are a lot of theories about the Moorgate accident. I am sure the man just forgot where he was and froze when he realised what was going to happen. There's lots of interesting stuff in here. About the Moorgate Accident, they said on some documentary that sometimes a tube driver can be "hypnotised" by the pattern of the "ribs" of the tube passing by (it's not perfectly smooth)....is this what causes that "state of mind?" Or can the same thing you're talking about happen in subsurface tunnels (e.g. Metropolitan) and surface sections? Now about the PPP, sure, they're not handing over the Tube to Railtrack, but its really close. And yes, there is a need for more lines. The Victoria line is a victim of its own success. Its purpose was to relieve certain commuter trains that served north-eastern London. Because of this almost every station on the line has interchange with mainline or another tube. And it did its job well. Now, more lines are the answer. Some PPP proponents say that "more lines and better stations and system-wide renewals" will be the result of PPP. I'll believe it when I see it! Tubeprune's experience of train driving is that it's not the pattern of tunnel ribs or, as sometimes suggested, lights flashing by, but just the sheer boredom of the job. Your mind wanders, just as it does when driving along a motorway. Drivers on the London Underground are called "Train Operators". The name first appeared in 1963 when ATO was being tried out on the Central Line so as to distinguish between the manually trained drivers, who were then called "Motormen" and the ATO operators. From Tubeprune to uk.transport.london newsgroup, 14 May 2001, in response to a lot of wild theories about why a train hit the stops at 35 mi/h and killed 43 people. Tubeprune was involved with the enquiry. Suicide was ruled out for the reasons offered by Clive - he had cash on him to buy his daughter a car that afternoon and why would he wait until the 4th trip. He was also known as steady and reliable - not the suicidal type. Tubeprune was acquainted with him from his days as a guard on the Metropolitan. He most likely "ran out of railway". Sometimes a driver goes into a state of mind where he is detached from the railway. If this happens at a station you can sometimes overrun or miss it altogether. It has happened to Tubeprune. If you are not likely to stop under such conditions, you carry on to the next station. Trouble is, Leslie didn't have a next station. He ran out of railway. May he rest in peace. Tubeprune says, of course, Ken Livingstone is right. The whole PPP process is flawed. There is no sense in separating the day to day operation from the maintenance and renewal programmes. This will make co-ordination more difficult at a time when it is most essential. What's more, no matter how much money you throw at the system, the passengers will only see how the operation works and if that is done badly, as it is today, no amount of new equipment will make it work better. Did you know, failure rates on the Victoria Line are better today than they were 20 years ago? So why is the system not seen to be working well? Because there are twice as many people using it today as there were 20 years ago. It's overcrowded. What is needed is more lines as well as renewals for the existing system. I have a question: I'm due to be starting work as a trainee driver (oops, I meant operator!) based Wembley Park on the Jubilee. How difficult is the job of operator, and what is Wembley Park depot and the Jubilee line like to work? Once you get used to it, the job isn't too bad. Early shifts are better if you can overcome the early starts. You get some free time in the afternoons. Late shifts mean drunks and hooligans, muggings and more trouble with passengers in general. However, you do get the long daytime to yourself. The job can be boring, particularly the tunnel section and you don't get to see the beautiful architecture of the stations. However, you do get the long open section north of Finchley Road. You generally get left alone and you look forward to the breaks to have a chat with colleagues. The trains are new and are getting more reliable. None of the new trains are as good as the old A Stock on the Met. or the 1959/62 tube stocks from the Northern and Central, because they don't handle as well but the cabs are better. Good luck with your training. Enjoy it and let us know what happens. It would be interesting to get a first hand account of the process as it is today. It's a long time since Tubeprune did his training. Thanks for the reply! I am a former train driver with Thames Trains so I think I know what to expect from the training, but I can imagine that the rules & regs will be totally different! Also, those long stretches of underground running! Nothing like that on the Great Western Main Line! Anyway, I'll let you know how I progress. Keep up the good work on the site, I've learned quite a bit from it. Thanks for the promise of updates. I will post them here. But, why on earth did you leave a nice route like Paddington to Oxford for the dark holes of the Underground? See also The Recruitment and Training of a London Underground Train Operator by District Dave. R Stock and Gloucester R C & W Co.
An interesting piece of trivia which you may or may not be aware of is that the original rolling stock for Toronto's first subway line was built over 1953 and 1954 by the Gloucester Railway Carriage & Wagon Co. who used a modified version of the London Underground R stock design. Anyway, do you know what eventually happened to the Gloucester R. C. & W. Co.? Interesting trivia - got any more? As for the Gloucester R C & W Co., it stopped building railway cars in 1968 but carried on building wagons. It was merged with Powell Duffryn in 1986. I live in Montreal, across the sea in Canada, but I do visit the UK almost every summer, and I like riding the tube in London. Why? I just do, ok? There's something about it....our "Metro" by the way, is completely underground and while all the stations are different architecturally, there are only 2 different ways that the train platforms can be, with the "two in the centre" being the most common. "Great Portland Street" and "Euston Square" and the Circle/H and C platforms of "Baker Street" probably look the most like Montreal Metro stations at the platform level. All our lines here have ATO and the "newer" MR-73 rolling stock has annoying announcements. Anyway....my favourite LU lines? The ELL and the Jubilee. May I ask what your favourite LU line is? And your favourite stock? I like Tube stock '96 and D stock. Also, I'm a bit disappointed at one thing that's disappearing...hanging balls. I mean those things you see on D stock, Tube stock '59/62, and some DLR trains. Only in London did they ever have it! I noticed an error on your site....the Waterloo and City Line DOES use the standard "Yerkes" electrification used by the LU...in fact they've been running "4-rails, 630v DC" before that line was officially an LU line. In 1993 British Rail decided to replace the ancient EMUs. They decided at the same time to replace the electrified rails, and switched to the LU system and purchased some Tube stock '92. But you can still tell it wasn't always an LU line...at least one of the trains is in its old Network Southeast livery and there is ballast and wooden sleepers underneath the rails, not standard practice in LU tubes. Thanks for the correction about the W & C. My favourite stock is the A Stock. Easy to handle and brake smoothly if you pay attention. I saw your glossary of LUL terms. I noticed the PCM entry and noted that you say that it was derived from the PCC. I should note that PCM controls on USA streetcars date to the 1920's, and was one of the control systems studied by the engineering staff of the Electric Railways Presidents' Conference Committee, the group that eventually developed PCC technology. PCM controls derived from the Pneumatic Cam control technology developed by General Electric(USA) just before World War I. In my looks at that stuff, I've seen it used on Chicago El cars as early as 1914 and was also a popular type of control on IRT subway cars in New York from 1915 to about 1925 and was also used by the Board of Transportation on some of its IND cars in the 1930's. It was looked at in Philadelphia for the Broad Street Subway in the 1920's, though not used in the long term, since Philadelphia opted for the Westinghouse ABF control system for its Broad Street Subway and Bridge Line trains (the latter, incidentally, were sound-alikes for the 1967 Victoria Line trains).